Just a quick OTN update. My Antarktis shawl is coming along nicely. The pattern is fantastic. 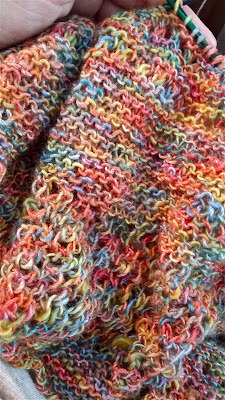 It contains lots of garter stitch for mindless TV knitting with just enough patterning to keep it interesting. And since I'm using another colorway of Pittura yarn.... I'm in knitter's Heaven.